How did you spend Australia Day yesterday? At a park playing footy? Maybe you were at the beach? or having a BBQ with your family and friends? Wherever you were and whatever you did, I hope that all of my Aussie friends had a fabulous Australia Day! 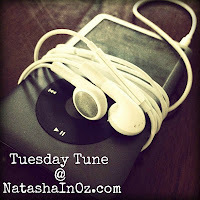 See you on Tuesday for a #TuesdayTune, my first one for 2011! Looks like a good day was had by all!! Gorgeous photos, and I do envy you that lovely, warm sunshine. That barbecue sure looks scrummy! My day was spent relaxing on bed rest..in the coolness of the AC unit it was flippin hot! Happy Australia day darling looked like u all had a great day! Well, I wasn't over there, but I hope you all had a wonderful day. You deserve it. Glad your special day was wonderful....so deserved after the tragic flooding! Ahhh all the Aussie Classics! Happy Australia Day Natasha! Looks like a wonderful time and it is so nice to look at sunny photo's! We got 5 inches of snow today. Thanks for sharing that song- loved it! Even though I'm only an honorary Aussie, I thoroughly enjoyed Australia Day. Glad you did too. Sounds like a delightful day. I would love some sun, a pool, and barbecue right about now! I forgot to say that I'm loving the new photos on the top of your blog! Happy Australia Day. Love the song, and I will be back for Sunday Song. That BBQ looks amazing. Looks like you had a wonderful day - nothing better than a day with the family having fun together! hi Natasha - thanks so much for stopping by my page this week! I can't remember if I told you this before, but I spent a month in Melbourne one summer - it was WONDERFUL. I absolutely loved Australia, just not the flights to get down there! Beautiful video! Enjoyed the pic's of your family. It seems you all had a very nice day! The Seekers - are they still singing? I guess it was in the 60's that I first heard them sing wonderful folk type music, and then became more aware of your beautiful country. Auctions for the Qld Flood Appeal. Thank you and a prayer request. A trip down memory lane...blogger style!